Find the 2019 AFL Season Draw & Fixtures listed below. 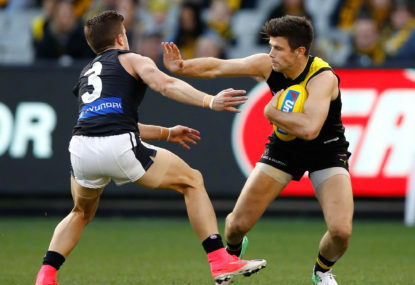 The 2019 AFL season will begin on Thursday, March 21, with the traditional opening fixture between the Carlton Blues and Richmond Tigers, and will finish on Saturday, September 28 with the grand final. For more AFL action, check out The Roar’s AFL news and video page for the latest AFL highlights and AFL videos. Also, you can view the complete AFL ladder here. To keep up to date with all the latest AFL results and live scores, check out our AFL live scores page. * – ‘Broadcast’ refers the host broadcaster in Victoria. All matches featuring a non-Victorian team are broadcast on Seven in that team’s home state and, in the event of a clash, may replace the match listed for Seven in that state. ** – If Marvel Stadium is required for the 2019 A-League grand final, the Essendon vs Fremantle and Port Adelaide vs Gold Coast matches in Round 9 will swap times.